'I've been thinking about Bikram Yoga since many years ago, I just never had the right impulse to try it out. So when the girls called that they are driving to Prague to give it a shot, I was on board! It was tougher than we thought though ... yet exciting! We will be back! 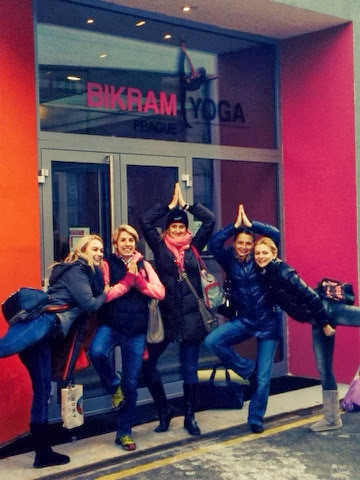 The true Bikram Yoga can be only practiced in certified studios with certified teachers - they get 9 week training in LA for a bargin price over 10 thousand dollars! Man, these people must LOVE Bikram Yoga. The teacher only shows parts of the poses as he speaks all the time to guide you through the dynamic sequence of the class. It was really well organized, he put the experienced people in the first row and the greenhorns (that would be us) just behind them. This way we could see how the poses should be performed and he could see how we were doing. You shouldn't push to the extrems of the positions so you can last throughout the session. You are not allowed to leave (trust me, you won't need to pee, you will sweat it all out...). I really liked the class, it was pretty demanding and I had like two moments when I had to get out of the pose and breathe through to relax in order not to faint. But that quite normal. Even our friend Petra who is great power yoga instructor and personal trainer had these issues... You also can drink only at specially dedicated moments, so you should drink plenty of water before the class and after as well. It took me more than 5 minutes to get myself together after the class. But after those first moments of weakness my body was flooded with energy! I had trouble sleeping though, but I will be trying more classes as I purchased the 10 day unlimited trial (it is worth it if you go at least twice). So I will report more about that. I loved getting my muscles stretched more and my spine more flexible. We do many similar exercises with The Coach. So I am thinking this could be great cross training activity as long as I manage to do all my training while coming to the class once or twice a week. We shall see..
Any runners out there practicing Bikram Yoga??? Any advice on how to put it up with your training? 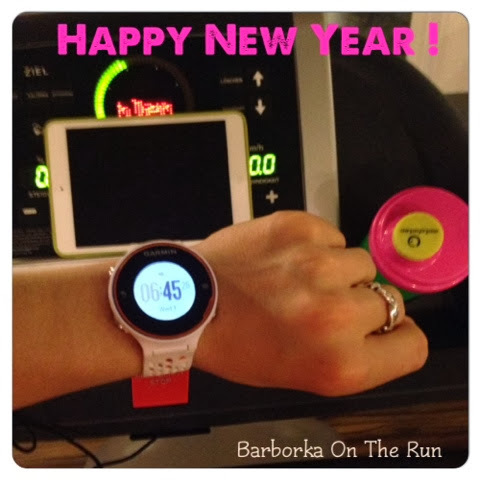 Photo from my New Year's run at 6:45 am at the hotel gym, I felt so excited doing the thing I love first thing after getting up in the new year of 2014! (I couldn't sleep - needed to get that extra wine out of my system :) ). But then the unimaginable happened: I finished the third interval and I felt like wanting more!!! You have to understand this: I am what Craig McMillan calls endurance monster. I can swallow miles and miles, but the speed work is always super tough for me. It is truth that 3 reps are funny in comparison to 12 or 16 that I do as the races come closer, but anyway. First time in the 2 and half years we have been working together with The Coach I asked for MORE speed work than he had planned for me. And it went great! I crushed the 4th 500 m little faster than the previous 3. I don't want to brag, it is still damn snail pace, but I am really excited. Today's message: my dear friends, don't be afraid of wanting MORE and striving for your BEST possible self!